I think the kitchen faucet is one of those items we take for granted until either yours stops working or you get one that is so cool it puts your circa 1980’s faucet to shame. We found out how much we took faucets for granted last year when our faucet ended up being a trickle of water. It took forever to do anything in the kitchen that required water. Of course we hired a plumber to get it fixed, but to this day I’m grateful we now have a properly flowing kitchen faucet. A great kitchen sink can provide you with a good spot for preparing food, washing dishes, filling pots, etc. The sink is integral to the kitchen; just like kitchen lighting, appliances, etc. These days there are amazing faucets you can choose from including high-tech options. There are many types of kitchen faucets that you can use in your kitchen right now. There are faucets that finish your kitchen sink in style with spray heads, double and single handle faucets, and pull-down kitchen faucets for an improved water flow and easy washing, as well as different finishes such as stainless steel. These are designed with many functional features and can make a world of difference in your space. The point of this article, which took many hours to put together, is to help you choose a faucet. There are many options, features, design and functions to consider. We break down every element of a faucet, explain those elements and include examples so you can figure what it is you want and what you don’t want. A pull-down kitchen faucet uses a spray wand that pulls down straight into the sink. This can work for cleaning dishes or produce. It is the most basic type of faucet you can order today. A pull-out faucet is different for how it can be pulled out directly towards you. It can work with a small button on its tap that allows you to adjust the flow of water coming out of the faucet. The biggest difference between the two is that the pull-out faucet has a body that works in a straight line. A pull down faucet is one with a curve that can only be pulled downward. A single-handle faucet uses a singular lever that you can position from left to right to trigger warm or cool water. It can take a bit of time to get the water to your desired temperature depending on what you have to work with. A dual-handle option has separate levers for warm and cool water. Sometimes, these two handles can be attached to the same central piece but, in other cases, they can be placed a few inches apart from each other. Either way, they would be right on the sides of the main tap. This would also require separate connections to hot and cold water just like what you might find in your bathroom. A commercial style faucet uses a longer flexible design. It is more flexible from the base and doesn’t have as much of a cover to it. Depending on the model you choose, you might find multiple taps for different needs. This is designed to create a more modern appearance in your kitchen. When looking for something more flexible, a separate spray faucet might be ideal. This uses a separate handle with a trigger that can activate a spraying motion inside the sink. The regular flow of water from the main tap will work when you are not triggering the separate spray nozzle. The handle will be linked to the water supply that comes from a regular tap. When you turn on the normal tap, the spray nozzle will be active as water can be quickly rerouted to the tap without problems. A pot filler faucet is made with a special body that moves outward. It can swivel outward and go over a pot or other large item in your sink. This is identical to what you might find in a commercial sink. Some models like this are made to fit onto a wall and can link to your plumbing system from there. The last option is a motion detection-based choice. This works with you simply placing your hand over a sensor to get the water to come out. You could also place a pot or other utensil under the tap. You’d have to check on how well the sensor on such a unit works to make it effective though. Also, you can always adjust the temperature of it by simply using a lever at the base. The sensor will typically be placed in the middle part of the faucet near its base. It should be easily visible through a dark spot. This should be used properly so you’ll actually get such a special faucet like this to work properly. Let’s get specific here to help you figure out exactly how to go about choosing a faucet. There are several components to a faucet. For each component there are different options. All images in this section courtesy of Wayfair.com. The neck is the “tube” so-to-speak that carries water from the mount-location to the spout. Faucet installation takes into account the number of holes you must make into the counter to install the sink. The number of holes range from one to four. It all depends on the design you get. All images above under the “Parts Explained” section courtesy of Wayfair.com. A bronze style is made with a darker tone in mind and has a rustic appeal to it. This could add a nice style that prepares a quaint look at any point in your kitchen. It has a good style but it does require plenty of polishing. A zinc alloy mixes zinc with copper to create a brass-like style although it can be painted with a nicer silver tone if preferred. This works well in most situations and will not corrode or rust easily. Stainless steel will fit in perfectly with a good number of sink basins that you have to work with. 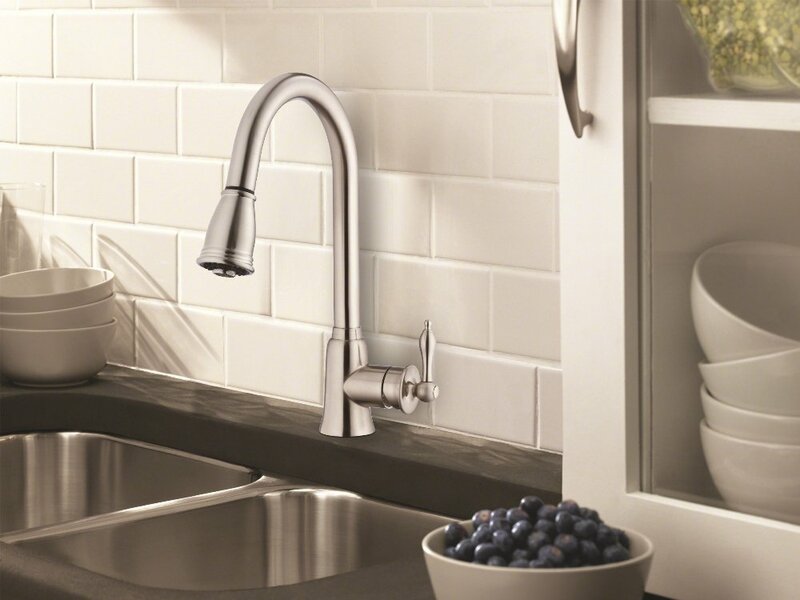 A stainless steel faucet will come with a shiny style that is easy to clean off. You should make sure it is treated carefully though as it can scratch. Copper comes with a darker tone but it still manages to create a refined look. This is best suited for classic-inspired sinks. It should be polished regularly so it can stay beautiful. Also, this works best if you’re in a kitchen area where there isn’t far too much light, what with the shiny surface possibly causing quite a bit of light reflections depending on what you have. Although a plastic faucet is cheaper and smooth and can be prepared in one of many colors, you’d have to be cautious with one. You do not want to get into any situations where the faucet might chip or break. Also, it might not look as refined as other options unless you ensure that what you order fits in well with other materials inside your kitchen. To get a quality kitchen faucet, you will have to spend a good deal of money on it. A typical faucet can cost about $100 to $300 depending on the materials used and how many parts are in it. A faucet with more parts will cost more for you to get. A shinier and more elaborate faucet made with fine metal materials may also cost more. A bronze or copper faucet could go for $300 to $500 in some cases. The cost will be rather varied based on the effort needed to get it installed. Make sure you look at how well the installation will work and that you have a clear idea of how water connections are to be used when getting the installation ready. The size of your kitchen faucet has to be checked carefully. You should watch for the hot and cold water inlets when getting it installed. The inlets are typically about 8 inches apart from each other. This helps to create a standard where your faucet should be about 8 inches long. The faucet itself can stick out by about 8 to 12 inches from its base. This should be enough to go over your sink basin. It can also be about 12 to 18 inches high depending on the model. Check on how your faucet is organized so you can have something that is easy to use and isn’t too complex in its overall design. Soap dispenser: A soap pump may be added to a faucet. This could match up with the rest of the faucet and be placed right next to its main parts. A small button could be added at the tap area. This could allow you to adjust the flow of water. This does especially well if you don’t have a separate trigger nozzle on your faucet setup. A garbage disposal button may also be applied to the side. This could be flat in surface and placed near the faucet to trigger the disposal. Spout swivel: You can get faucets that swivel either 180 degrees or 360 degrees. Adjustable angle: Some faucets can be adjusted angle-wise. Adjustable stream: You can buy faucets with different stream options. We have this; ours is rather rudimentary, but we can opt for the regular stream or spray stream. Built-in water filter: If filtered water is important, there are faucets with built-in water filters.